The 2019 Investing in African Mining Indaba continued today in sun-drenched Cape Town. On day two, delegates of the Indaba were afforded the opportunity to hear from two African heads of state – Ghana’s President Nana Akufo-Addo and President of South Africa Cyril Ramaphosa. 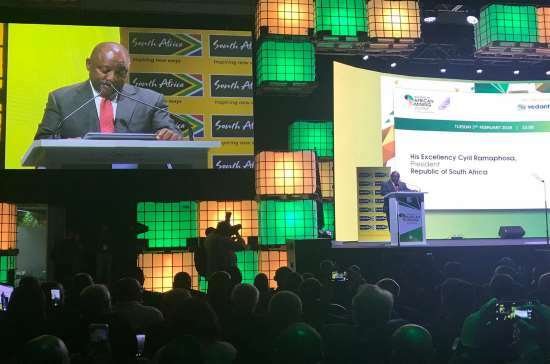 The Mining Indaba welcomed President Cyril Ramaphosa to speak at the landmark 25th anniversary event – the first time a South African head of state has delivered a speech at the Indaba. Throughout his speech, Ramaphosa underlined the need for a collaborative approach to inclusive development in the mining industry, reiterating the message delivered by Ghana’s President Nana Akufo-Addo earlier in the day. “We are here together on a journey of inclusive development in South Africa’s mining industry,” he said. “Today I want to say this collaborative approach means we all have tasks. I believe that in doing so we have our own responsibilities as government, companies, labour and communities. “It is through creating shared value that we can ensure a sustainable mining industry,” Ramaphosa concluded. The West African gold industry is one of the continent’s brightest sub-sectors, and this strength was advertised on day two of the Indaba. Endeavour Mining CEO Sébastien de Montessus delivered a session on the Attractiveness of Gold Mining in West Africa. Throughout his presentation, he underlined Endeavour’s unwavering commitment to gold in West Africa. “As a key player in this region, we are so bullish about West Africa. Endeavour is emerging as the only multi-asset mid-tier West African producer,” he said. Endeavour operates four mines across Côte d’Ivoire (Agbaou and Ity) and Burkina Faso (Houndé and Karma), which produced a total of 612,000 ounces of gold in 2018, beating the company’s guidance range of 555,000-590,000 ounces. South Africa’s Minister of Trade and Industry Rob Davies told listeners at the Mining Indaba to expect tough announcements relating to Eskom in the near future. In a roundtable discussion hosted by the Department of Trade and Industry, Davies said: “The spirit of addressing the challenges with Eskom is to grapple with the real problems and not to put these aside. Check back to RGN tomorrow for a round-up of day three at the Mining Indaba.